Through this April 30th a huge selection of my paintings on paper and panel is on display at Karis Art Gallery on Hilton Head Island, South Carolina. 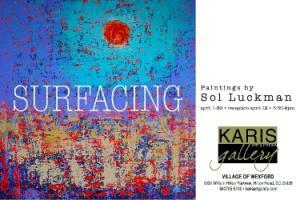 You can read the press release for this show, titled SURFACING, [by following the link below]. Multi-award-winning author Sol Luckman receives yet another major recognition, this time for Humor in the 15th Annual 2018 Best Book Awards. The Best Book Awards, sponsored by the American Book Fest, selected Sol Luckman’s irreverently hilarious book of satire for the awake and awakening crowd, THE ANGEL’S DICTIONARY: A SPIRITED GLOSSARY FOR THE LITTLE DEVIL IN YOU, as an award-winning Finalist in the Humor category in this year’s contest. The competition was open to titles published from 2016-18 and drew over 2,000 entries vying for recognition across numerous categories. Jeffrey Keen, President and CEO of American Book Fest, commented that this year’s contest attracted “a phenomenal mix of books from a wide array” of independent as well as mainstream publishers. St. Martin’s Press, Penguin Random House, Simon & Schuster, Hay House, Palgrave Macmillan and New American Library are just some of the hundreds of publishers that entered books in this year’s competition. Already established as the Winner in the Humor category of the prestigious 11th Annual 2017 National Indie Excellence Awards and a Finalist for Humor in the 2018 International Book Awards, THE ANGEL’S DICTIONARY is a comical lexicon for coming to terms with modern culture (or lack thereof), politics (so-called), and life (such as it is). In its five-star review of this knee-slapping “tour de farce,” Readers’ Favorite had this high praise: “Irreverent in its honesty and take-no-prisoners approach, THE ANGEL’S DICTIONARY: A SPIRITED GLOSSARY FOR THE LITTLE DEVIL IN YOU is an honest appraisal of words in terms of today’s sensibilities. Sol Luckman has picked up where writers like Mark Twain and Ambrose Bierce left off over a century ago, identifying new associations for words and phrases to match what they really represent today […] They say many a true word is spoken in jest, and perhaps Luckman’s humor is a well-timed wake-up call to be heeded while we still have time to ask important questions.”Taking a page from Ambrose Bierce’s satirical masterpiece, THE DEVIL’S DICTIONARY, THE ANGEL’S DICTIONARY reinvigorates satire to prove that—though we might not be able to change the world—we can at least have a good laugh at it. Then again, maybe laughter can transform the world! Previously, Sol Luckman’s critically acclaimed spiritual adventure novel, SNOOZE: A STORY OF AWAKENING, won the 9th Annual 2015 National Indie Excellence Award for New Age Fiction. Luckman is also known for his bestselling nonfiction books, CONSCIOUS HEALING and POTENTIATE YOUR DNA, which explore the role of consciousness and DNA in personal healing and transformation. 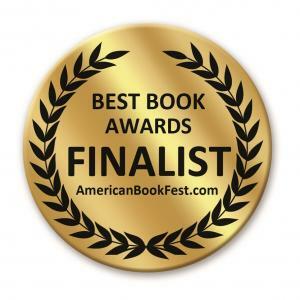 Award-winning author receives another major recognition, this time for Humor in the 9th Annual 2018 International Book Awards! 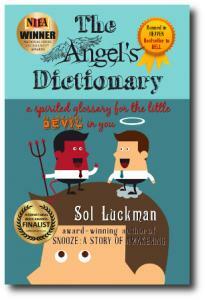 The 9th Annual 2018 International Book Awards, sponsored by the American Book Fest, recognized Sol Luckman’s diabolically lighthearted book of satire, THE ANGEL’S DICTIONARY: A SPIRITED GLOSSARY FOR THE LITTLE DEVIL IN YOU, as an award-winning Finalist in the category of Humor in this year’s competition. 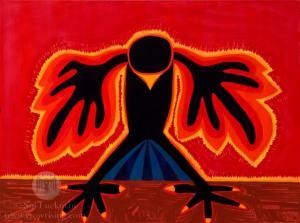 The IBA is a distinguished international book award competition based in Los Angeles and Phoenix. This year’s competition was open to titles published from 2016-18 and drew over 2,000 applicants vying for recognition in approximately 90 categories. Jeffrey Keen, President and CEO of American Book Fest, commented that this year’s contest attracted entries from publishers and authors around the world. Penguin Random House, Simon & Schuster, Disney Hyperion, TarcherPerigee, Atria Books, Bear & Co./Inner Traditions, New American Library and Hachette Book Group are just some of the hundreds of national and international publishing houses that entered books in this year’s competition. Already established as the Winner in the Humor category of the prestigious 11th Annual 2017 National Indie Excellence Awards, THE ANGEL’S DICTIONARY is a satirical lexicon for coming to terms with modern culture (or lack thereof), politics (so-called), and life (such as it is). Taking a page from Ambrose Bierce’s satirical masterpiece, THE DEVIL’S DICTIONARY, THE ANGEL’S DICTIONARY reinvigorates satire to prove that—though we might not be able to change the world—we can at least have a good laugh at it. Then again, maybe laughter can transform the world! It has been a while since I’ve posted a blog having to do with my painting, so I thought I’d take this opportunity, before 2018 slips by, to share a retrospective on my artwork from 2017. Overall, 2017 may have been my most fulfilling year as a painter. The range of my ink artwork expanded significantly as I mapped my signature One Brush Technique into some interesting new territories. Additionally, a third ink painting of mine (from 2010) appeared on the cover of a mainstream book on shamanism, which was highly gratifying. My full portfolio, available as prints and in a large selection of merchandise, can be viewed here. 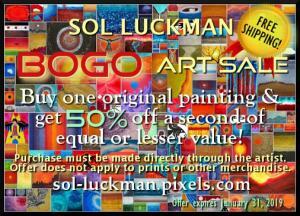 Original works can be purchased here. Having played around with watercolors for years, I started painting seriously with inks in 2010. 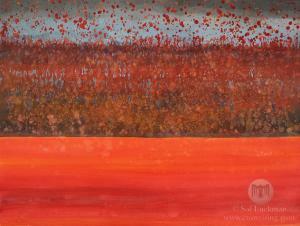 Since then my portfolio has expanded from a mere handful of pieces to over 250 works on paper and canvas. Several years ago, Destiny Books asked for permission to use one of my ink-on-paper paintings on the cover of Itzhak Beery’s THE GIFT OF SHAMANISM. Award-winning novelist receives major recognition as a humorist from the 11th Annual 2017 National Indie Excellence Awards! 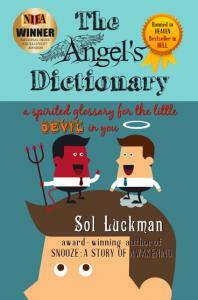 The 11th Annual 2017 National Indie Excellence Awards recognized Sol Luckman’s wickedly lighthearted book of satire, THE ANGEL’S DICTIONARY: A SPIRITED GLOSSARY FOR THE LITTLE DEVIL IN YOU, as the winner in the category of Humor in this year’s competition. This prestigious national award, based in Los Angeles, is open to all English language books in print from small, medium, university, independent and self-publishers. Winners are determined based on “overall excellence of presentation in addition to the writing.” THE ANGEL’S DICTIONARY is a satirical lexicon for coming to terms with modern culture (or lack thereof), politics (so-called), and life (such as it is). Wow. I just learned that three of my paintings done during a particularly prolific stretch in the summer of 2012 recently achieved a rare trifecta! 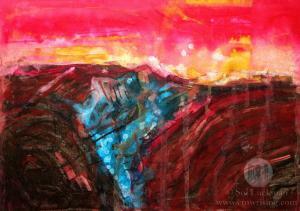 In Noenga Artist Community's October peer voting contest, my ink-on-paper painting BORREGO BADLANDS won 1st Place for Technique. Being my first 1st Place finish on Noenga, an international website featuring some really gifted artists, this would have been quite gratifying by itself. But then, I also learned that another of my pieces, TUFAS IN THE MIST, placed 2nd in Technique as well. And to top it all off, completing my artistic trifecta, my painting MOJAVE DAWN placed 3rd in Technique! I really appreciate everyone who voted for my work. Thanks so much for reading this update!